In Thailand, there are so many varieties of mangoes ranging from over a kilo per mango to a tiny little mango the size of an olive. Some varieties are lip puckering sour when green but soft and sweet when they ripen. 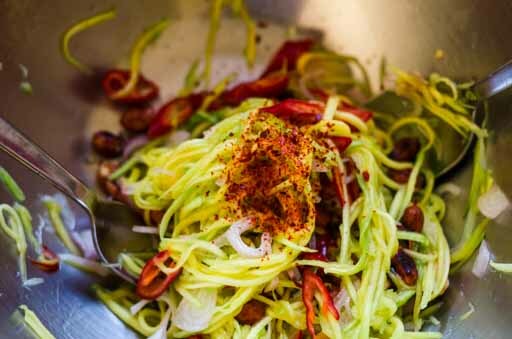 A few varieties are so sour that they are perfect for making this Mango Salad. 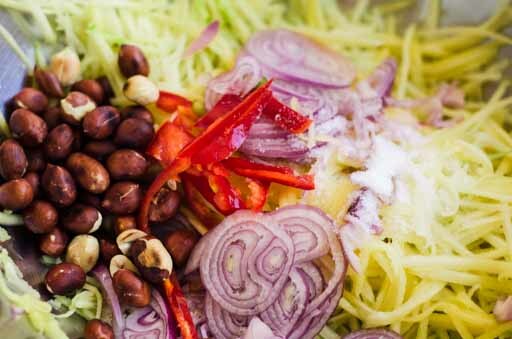 This Mango Salad is fairly easy to make and often wows people. It encompasses all the great Thai flavors. A perfect combination of sour, salty, nutty and spicy draws you back for more. And dialing down on the heat won’t ruin the great flavors. I make Mango Salad very often during the mango season. My local Hispanic markets have quality mangoes at a great price. Once I got 3 mangoes for a dollar, what a find! Green mangoes can cost a fortune anywhere from $3/lb to $5+/lb. I sometimes find green mangoes in a regular mango pile. This method is a lot more cost effective. And especially during the mango season, there are a lot more to choose from, a few are bound to be super green. 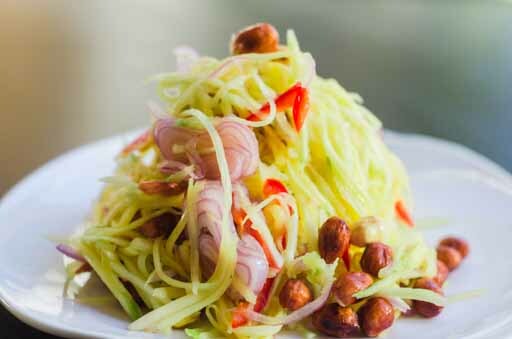 Mango Salad is a great dish to make it as spicy as you like. 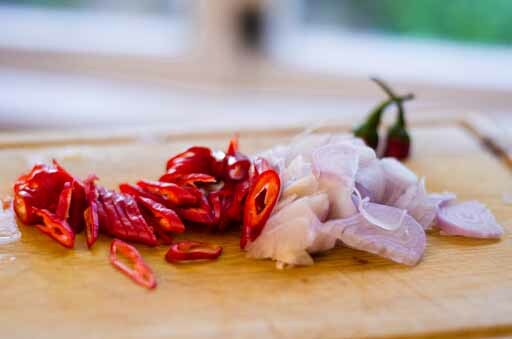 To make it spicy, you have a choice of adding the ground chili pepper or fresh Thai chili peppers. For non-spicy version: You can use sweet Italian peppers which I did when making the recipe for the non-spicy crowd. The level of sourness from green mango can vary depending on the variety. 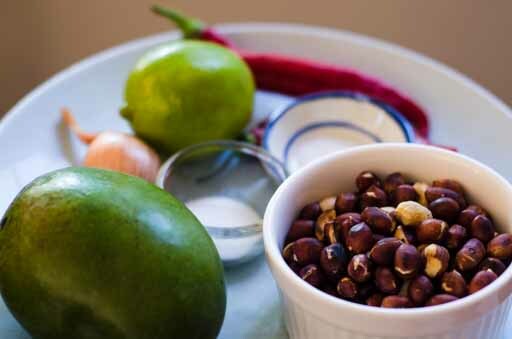 With some variety, you may not need the lime juice. Toast the peanuts in a pan for 10-15 minutes over a medium to medium-low heat. It takes a while to cook the raw peanuts thoroughly. When done, let the peanuts cool. 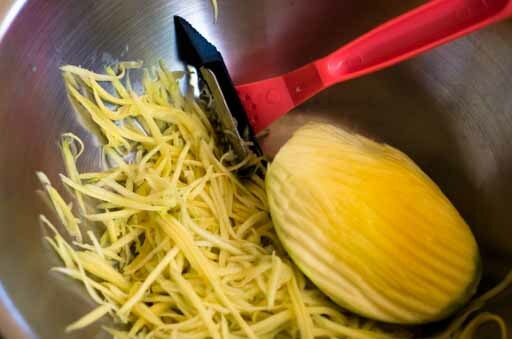 Peel the green mango and shred it with the shredder until you hit the single large seed. Slice the peppers and shallots thinly. Put all the ingredients in a large bowl and mix well. Taste to see if you need lime juice. With a natural product like mango, the sourness varies depending on the variety and how green the mango is. Add lime juice as much as you like, start with a small amount first and keep adding until you hit the right spot. I usually start with ⅓ of a lime. Adjust the taste to your liking. Add ground chili for a spicier salad. If your salad is very spicy, you may need more seasonings. Serve as an appetizer or with the meal.